Coming all the way from Italy in my friend’s luggage we have Alpenliebe, manufactured by Perfetti Van Melle. Perfetti is probably best known in the US for Mentos and AirHeads. If you’re wondering what Alpenliebe are like, imagine the size, shape, and consistency of a Werther’s Original if it was caramel flavored, now dip it in chocolate and coffee flavoring. While I normally hate anything coffee-flavored, I didn’t really mind these. I wasn’t even going to try them, but I figured since they travelled all the way from Italy, I couldn’t NOT try them. Once I got over the initail “Wow this is coffee” flavor, they were actually pretty good, and they lasted a really long time, which was good as I was stuck at my desk all day munching on them. These are also sugar-free (Sensa Zucchero in Italian) and come in a box that is like a tiny cigarette pack, except that they have a little tiny flap inside that holds the lid closed, which might be one of the greatest things ever. Overall, pretty good, especially if you are looking for a hard candy, and are a big fan of coffee flavoring, as I’m sure some of our readers are. These don’t appear to be available in the United States, but where there’s a will, there’s a way. 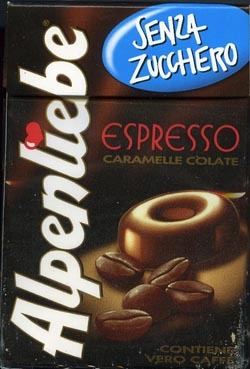 I brought 2 boxes of Alpenliebe – Espressoâ€¦ candy back from Italy without trying them. What a mistake; if I’d tasted them in Italy, I’d have brought back a case! If you like coffee, these are wonderful; one of the best coffee flavored candies I’ve every tried, and I’ve been tasting coffee candy for decades. My dad also brought these candys back from Italy. I just had one. They are soo good. Good is not the word! I brought back 2 boxes from Italy, and like Alan U says, I should have brought back a case. I will like to get an information about your candies if you dot mind sending my anwser in french since I am in french speaking country (Guinea)W Africa. I saw Alpenliebe in a convenience store in Shanghai.. I tried and I gave it to my friends. They love it! Does any one know if we could get then in UK!? mij in mijn woonplaats papendrecht kan kopen? Mijn moeder mag allen suikervrij-snoep. Zij is dol op caramel en espresso van Van Melle. Eerst kon ik deze snoepjes kopen bij A.H.in Ridderkerk. Waar kan ik ze in in de toekomst kopen in Ridderkerk? Are your assorted fruit and cream candies gluten free?